We have a real treat in store. This weekend an HHR viewer sent me a wonderful collection of images which were intended to accompany an oral history by Elaine Woolston, who passed away in 2017. I'll share these images over a couple of weeks. We can't have all the fun at once, can we? 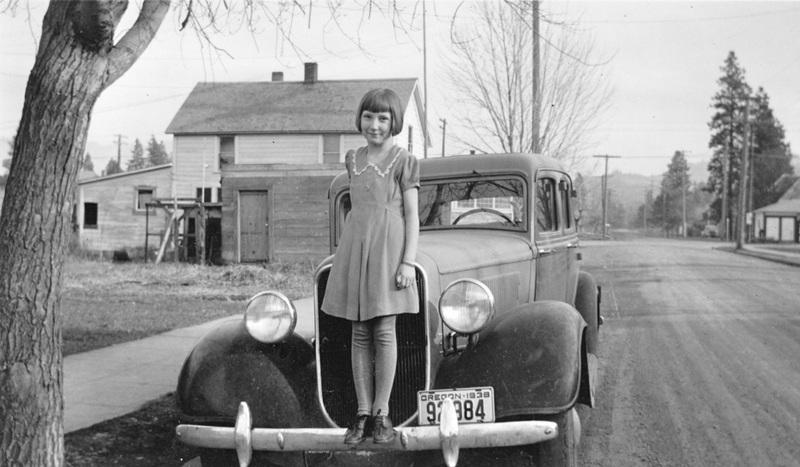 Here's Elaine in 1938 at age 8, at her home on A Street east of 13th Street in the Heights (camera looking east toward 12th Street). The family moved here after being displaced from their home near Koberg Beach by the Bonneville Dam project. She lived at this house from 1936 until her passing in 2017. You can learn more about Elaine's life here. We'll see some great views of the different stages of her life in the coming weeks. I think her house is just to the left in this view. It looks like that garage is the only tether to the modern day in the view below. She was the daughter of Francis and Geneva Woolston and sister to Arvilla Woolston., born in Utah. Her father was at one time the chief of police in Hood River. I look forward to meeting Elaine Woolston and her history. Other than Celilo, there seems to be very little personal history of the people who lost their homes to the dam projects. There is still one house where the shrubs are, an older house. So that might still be the one where Elaine Woolston lived. She tended her yard and kept to herself. Wish I had spoken to her. She avoided eye contact, but maybe had much to share if I had attempted a conversation. Contact Tanner Hall @Windemere Realty. He & his wife purchased that home & found some interesting things while they were re-modeling. And the automobile is a??? I'm going to guess it's a 1933 Plymouth Sedan. Hopefully the WAAAM guys will weigh in. I wish Elaine would move a little to the side so I could see the middle of the grill. I believe some of us met up with Chief Woolston in his official capacity. It is the home on the corner of 13th and A Street. I delievered meals on wheels to her their a few years ago before her passing. That garage was just east of the home on the corner of the lot. Thanks for the positive ID on the home location, Mary. Imagine the changes she saw outside her door in the 80 years she lived in that house. Amazing. I've walked in front of her place for years going from the shop to the bank, and would see her often. Thanks or sharing.